PIERCE THE VEIL, one of the fastest-rising artists on the music scene today, will release its new album, Misadventures, on May 13 (Fearless Records). Misadventures is the follow up to the band's 2012 breakthrough release, Collide With The Sky, that debuted at #12 on the Billboard Top 200 Albums chart, held the #1 spot on the Rock, Hard Rock, and Modern Rock/Alternative Albums charts, has sold nearly 350,000 copies, and earned the band a Gold single for the track "King For A Day". Check out the band's video announcement below; pre-order information for Misadventures will be announced shortly. The first single from Misadventures will be "Texas Is Forever", a punk-flavored song that goes back to the band's roots, and, according to the band, is a song that begs to be played live. It also happens to be the fastest song they've ever written. "Texas Is Forever" will be released on March 24. 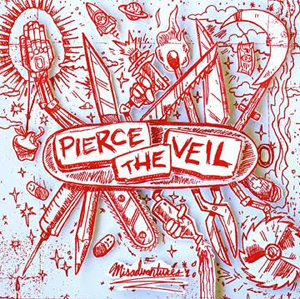 For Misadventures, the band - Vic Fuentes/vocals, guitar, Tony Perry/guitar, Jaime Preciado/bass, and Mike Fuentes/drums - worked again with Dan Korneff who co-produced Collide and recorded at his Long Island studio Sonic Debris on and off between Summer 2014 and Summer 2015. "It was exciting to do another record with Dan," said Vic. "We had gotten to know him really well on Collide, so there wasn't that initial period where you're trying to get to know each other. We just dove in and started to make music right away." Initial plans were for Misadventures to be released earlier, but touring commitments and the band's conscious decision to take their time to make the album the very best it could be, both musically and lyrically, set a different course. Explained Vic, "We went into this record wanting to top the last one, which we try to do with every record, and we kept setting the bar higher and higher." Vic's search for inspiration took him to a number of places to write the lyrics - New York, San Diego, Los Angeles, the Southern California mountain resort of Big Bear, Santa Barbara and Seattle. "I wanted every song to have real meaning, and thought that in spending time in different places, I'd find new inspirations - that's exactly what happened." "Phantom Power And Ludicrous Speed"
"Today I Saw The Whole World"
With PIERCE THE VEIL's penchant for playing live, expect them to support Misadventures with extensive global touring. The first round of dates will be announced shortly.